When it comes to recitals, spinto and heldentenors have limited choices for repertoire. Their voices are just too big for German lieder, French art songs and Russian romances. 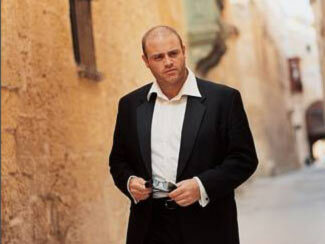 Take for example the Maltese tenor Joseph Calleja who performed over the weekend as part of the Roy Thomson Hall vocal series. Calleja has a glittering career. He sings the big, hearty meat and potatoes repertoire in the world’s greatest opera houses. As a result, his recital featured opera arias, and Neapolitan and other parlour songs. Not exactly substantial stuff. Despite the shortness of the program, it was obvious that Calleja is a great talent. He may not be subtle, but he takes his high notes effortlessly and doesn’t hold back. There is a gentle vibrato to his voice that gives it colour, as well as a sweetness in his upper register. His phrasing is lovely, and of course, there is the de rigueur Italianate sob. He soars in the Verdi and Puccini.